Recognized by the bright lavender colour, Hockey Fights Cancer is a league initiative that was put in place to raise funds as well as promote awareness for cancer. Founded in 1998 by the National Hockey League in partnership with the National Hockey League’s Players’ Association, this initiative has worked to raise over $16 million in support of cancer programs, hospitals, research institutions and charities across cities in the NHL. Hockey Fights Cancer is supported not only by the NHL players and alumni, but also the officials, trainers, equipment managers, corporate partners and many more. On Tuesday, November 15, 2016 the Winnipeg Jets will host their Hockey Fights Cancer night at the MTS Centre when they face off against the Chicago Blackhawks. With puck drop at 7:00 p.m., fans will have the opportunity to join the fight, alongside many individuals whose lives have been touched by this disease. 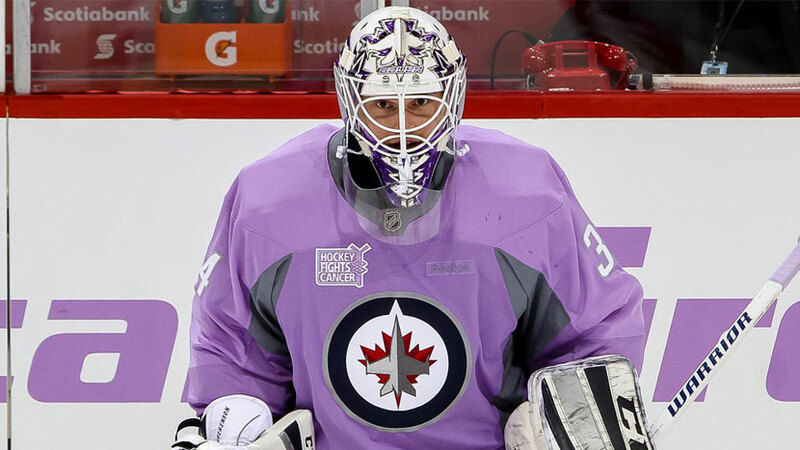 The Jets players will hit the ice for warmup dressed in the official lavender-coloured Hockey Fights Cancer jerseys, and the coaches and broadcasters will be sporting lavender ties. To support Hockey Fights Cancer until November 15, fans can purchase raffle tickets for $5 each, giving them a chance to win 1 of 10 autographed Hockey Fights Cancer warm-up jerseys. In a show of strong support, fans have purchased all the autographed mystery pucks, which were selling for $40. The mini sticks are sold-out, too. They were selling for $20. With 100% of the proceeds going to CancerCare Manitoba’s pediatric clinical trials, Hockey Fights Cancer is set up at every Jets and Moose home game up until November 15, including the Heritage Classic, raising money, and bringing attention to a cause that is near and dear to so many hearts. The Winnipeg Jets are consistently among the leading franchises in the National Hockey League for money raised for the Hockey Fights Cancer campaign, and Paulsen attributes it to the underlying personality traits and generous nature of Manitobans and Winnipeg Jets fans. We are all on the same team, fighting for the same cause.